When a business has been around for over 40 years, you know they are doing something correctly. In our case, we have been providing experienced and knowledgeable tree care services throughout Northern Virginia. Our service areas include: Alexandria, Arlington, Ashburn, Fairfax, Falls Church, Great Falls, Loudoun, Mclean, Springfield, Reston, and Vienna, VA.
Our services aren’t limited to merely trimming trees, however. You could call us “tree doctors” of sorts, because we specialize in all things related to the trees in your yard. Our services include tree removal, tree pruning, pest control (think mosquitos, eastern tent caterpillars, flatheaded borers), in addition to a unique soil & roots care service. Beyond that, we offer stump removal, tree removal services, tree disease diagnosis and treatment, as well as an emergency tree removal service, for when you are in a pinch and need a tree removed as soon as possible. In today’s initial piece of a two part series, we will take a step back from some our previous, more in-depth posts. Today we will start at the very beginning conceptually; why you should plant trees in your yard in the first place. Some reasons might be fairly obvious to some of our readers, while others may surprise you. Regardless, continue reading to hear some words of wisdom from an award-winning tree preservation company that has been around for over 50 years. Let’s get going! Let’s forgo the more obvious aesthetically based reasons to plant trees in your yard, in lieu of a more financially pragmatic justification. Trees increase property values, and it is an axiom of sorts to say that everyone wants their homes and property to have the highest possible value. Improving your homestead with tree planting and general landscaping could increase your property’s value by up to 20 percent. Talk about return on investment! Just make sure you choose a tree that is both beautiful and affordable, in order to achieve true ROI. Here’s a fun fact for you; aspirin was originally from willow bark. Well, not in ready-for-consumption pill form or anything, but the active ingredients are found in willow bark. And that is neat! So all you have to do is plant a willow tree in your yard, and if enough of us do it, every drug store in America will go out of business pretty soon. Just kidding. That won’t happen. But we hope you found the fact fun all the same! Speaking of axioms, this one might take the cake. But regardless, if you are considering becoming a bit of an an arborist by planting trees in your yard or property, this reason to do so shouldn’t be overlooked. As lush as it can be here in the Northern Virginia area, we all know how hot the sun can be on unshielded skin come high summer. By planting trees which are both leafy and tall, you can develop a canopy of sorts, that over time will develop naturally and give wonderful shade for you and your family. From a financial perspective, the shade could help you save money by using your air conditioner less than usual. A second financial benefit is that the canopy of leaves can reduce the fading of exterior paint and finishes on the outside of your house. Every little bit helps! 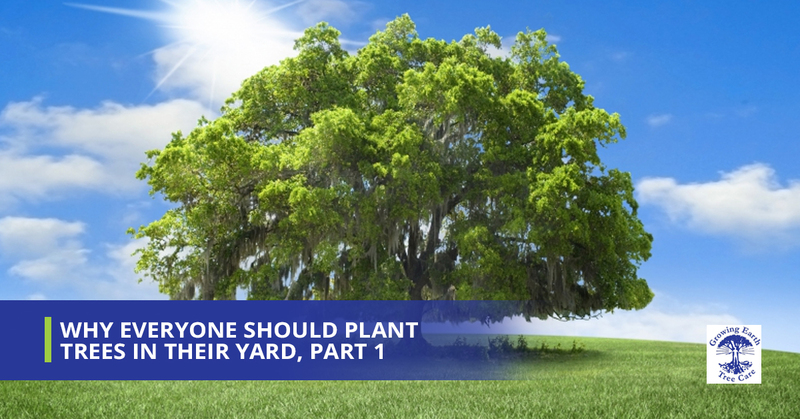 We hope that you have enjoyed part one of our two-part series on why everyone should plant trees in their yard. One of the biggest reasons which we will touch on further in part two is that if you are in the Northern Virginia region, you can rest assured that Virginia’s Top Rated Local Tree Care Experts are there by your side. No matter the service you need, we can provide the industry knowledge and care that is required to set your yard apart from the rest of the neighborhood’s. We are one of the select few local tree service companies accredited by the Tree Care industry Association. Quite simply, that means we are an elite team of tree doctors who understand the Mid-Atlantic climate better than most. Whatever tree service you are looking for, contact us today and get a free estimate!